A case of murder and rioting has been registered against 28 persons following the incident of violence over the alleged cow slaughter in village Mahav of Syana area of district Bulandshahr which took place on Sunday night in which two persons, Inspector Subodh Kumar Singh and a local resident Sumit were killed. After the violence came under control on Monday, the police started searching for the perpetrators of violence. A case was registered against 60 unidentified and 28 named persons from three villages of Syana area including Mahav for inciting violence and rioting. A violent mob of villagers on Monday had attacked the Syana police station with heavy stone pelting and firing for what they said was police inaction after beef was reportedly found in village Mahav on Sunday night. Inspector Subodh Kumar Singh of Syana police station was shot while he was trying to control the angry villagers who had jammed the road and were pelting stones on the police team. A resident of Chingrawthi village Sumit also lost his life in the clashes as villagers torched many vehicles and put the Chingrawthi police post on fire. Five cops were also reported as injured in the incident which has shaken Lucknow causing intervention of the top government officials. Heavy force is deployed in the area and police raided villages to arrest the named accused. Circle officer of Syana area Satya Prakash Sharma confirmed the arrest of two accused but refused to reveal their names. Available video clips are being used to identify those involved in the violence, he said. The top brass, including ADG of Meerut Zone Prashant Kumar, IG of Meerut range Ramkumar, SSP Bulandhshahr, and DM of Bulandshahar Anuj Kumar Jha carried the mortal remains of Inspector Subodh on their shoulders as a mark of respect before sending it to his native village in Etah. The officials are also monitoring the situation in the violence-hit area and teams are formed to nab the accused. Meanwhile, Amarjeet Singh, father of deceased Sumit, has demanded an ex gratia of Rs 50 lakh and a job of inspector in the police for Sumit’s elder brother Vineet. 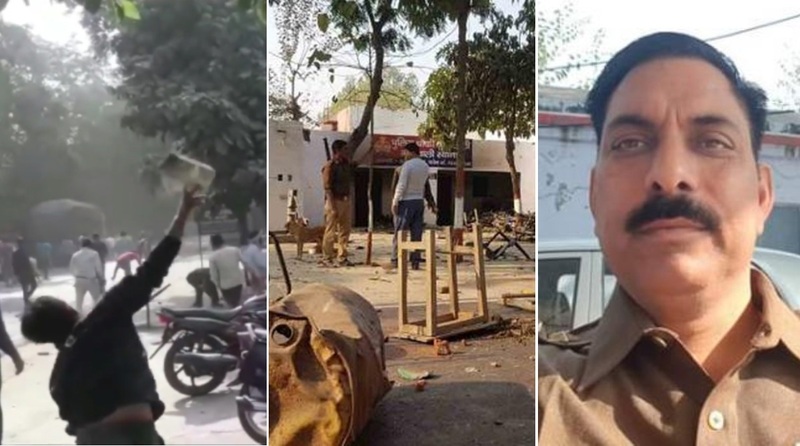 BJP’s western UP president Ashwini Tyagi, however, has expressed his unhappiness over including the names of Bajrang Dal, VHP, and BJP leaders in the FIR along with villagers. “On the basis of my feedback, I can say that they were not involved in violence,” said Tyagi, adding that the police should have included their names only after conducting a proper investigation in the case. Demanding a fair investigation, he held mishandling of the peoples’ anger responsible for the two casualties.